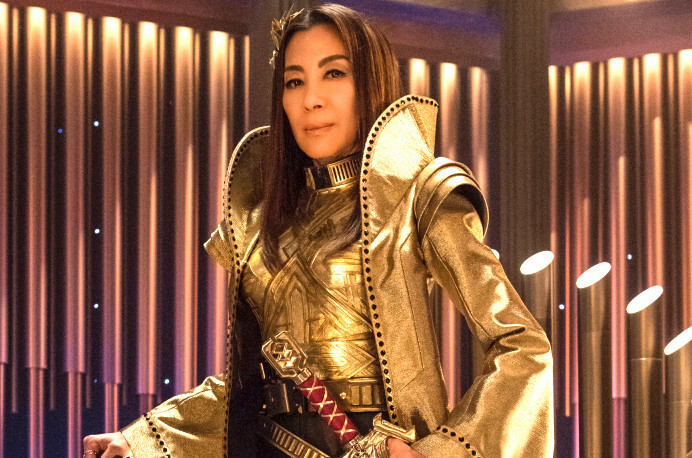 “Vaulting Ambition” — Episode 112 — Pictured: Michelle Yeoh as Philippa Georgiou of the CBS All Access series STAR TREK: DISCOVERY. Photo Cr: Ben Mark Holzberg/CBS ÃÂ© 2017 CBS Interactive. All Rights Reserved. Star Trek Discovery’s Empress Georgiou is getting her own CBS All-Access spin-off. The show will detail her adventures with the secret Federation shadow organization called Section 31. Michelle Yeoh returns to play Georgiou in the new series. For fans of the series, Captain Georgiou had died in the present timeline by the Klingons, but the Mirror Universe Georgiou was brought back into the current timeline by Michael Burnham (Sonequa Martin Green). The show will be produced by Star Trek Discovery creator Alex Kurtzman, CBS Television Studios, and Roddenberry Entertainment. Discovery writers Bo Yeon Kim and Erika Lippoldt will serve as writers and co-executive producers for the series, alongside Aaron Baiers (Star Trek Discovery). We can’t wait to see what badass Georgiou does next! Yeoh can be seen as Georgiou in the sophomore season of Star Trek Discovery, which premieres on January 17th on CBS All-Access.